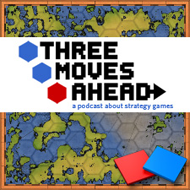 Three Moves Ahead Episode 73: What Made You? This week, hardware expert and long time strategy gamer Loyd Case joins Troy, Julian and Rob in a chat about how various advances and changes in the technological environment have changed how see and approach strategy games. Listen here. RSS here. Subscribe on iTunes.